Hey Bunnz! Thank you for taking your time in reading my blog and promoting it as well to your family and friends. And for that, I would like to share with you a Clarity Gift Certificate for an Intense Diamond Peel valued at P1,000. Please wait for my email as to how you can claim the GC. ...and the winner...my Julia! Receiving this Ohhh so beautiful Barbie 2010 collection. Chow Time, my favorite time!!! Prettiest in Barbie Attire. Same prize. She received this Barbie doll too! Winner of a cake too! and much more...girls were given lootbags with Barbie stuff, and a Red Ribbon Cupcakes..Moms and other attendees were also given Red Ribbon cupcakes. What made this event joyful is not the Intense Diamond Peel (worth P1,000) gift certificate given to all attendees (I'm not hypocrite to say it's not nice, because it is!). I was extra happy to see Cza Roman and Skylah. I've met Cza twice (BDJ last year and Bisolvon last February). Cza is one of those bloggers you'd love to see! She's not snob, she's nice, soft spoken (unlike me!!!) and of course a pretty woman inside and out! Red Ribbon whips up a sure comfort food list-topper with the new Chocolate Fudge Cake. Premium chocolate, fresh eggs, and creamy butter are perfectly mixed to make a very moist chocolate pound cake. It is then layered with luscious chocolate fudge filling and generously smothered with velvety chocolate icing. Quite simply, it’s what a chocolate cake should be. Whether for a special occasion or a simple gathering of friends and family, Red Ribbon’s Chocolate Fudge Cake is sure to make any day delightful. Give in to a slice or two with a cup of brew, freshly steeped tea, or warm glass of milk. Red Ribbon’s Chocolate Fudge Cake is available in regular size for P495.00 and junior size for only P295.00. Enjoy this and other lip-smacking cakes, pastries, and other specialty treats from Red Ribbon stores nationwide. Comfort food is like a warm embrace. It’s a back rub after a hard day. It’s a reassuring word. There is no one clear definition of what comfort food is, but we all agree how wonderful it makes us feel even with just a taste. Comfort food lifts the spirit. It’s familiar and nostalgic. It’s food that simply satisfies. All of us have our own list of comfort food, and in every list, there is always chocolate cake. Always. Just what makes it a comfort food? Is it the chocolate? Science offers an explanation about this magical ingredient that Aztecs used to worship. Chocolate contains tryptophan and phenylethylamine, chemicals that stimulate secretion of hormones like endorphins. These produce feelings of elation, attraction, and pleasure. How wise those Aztecs were. Is it the way it was prepared? Comfort food is not necessarily hard to prepare but one of the reasons they are special was the effort it took to make them. Chocolate cake is made with layer after layer of goodness. We taste the love that went into the preparation – that’s what makes us feel better. Is it the familiarity? We grew up with our comfort food. They are the food “like mom used to make” or Tita brings every time there is a family reunion. Chocolate cake may not have been served often, but memories of eating it bring a warm feeling because of its family ties. 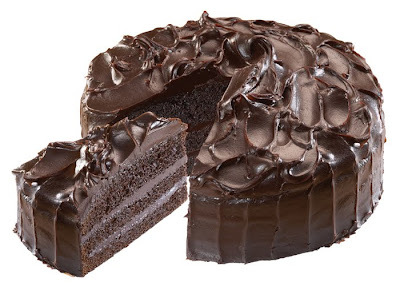 Whatever the inexplicable connection, we love chocolate cake and it loves us back. Red Ribbon whipped up a version of the classic chocolate cake with its new Chocolate Fudge Cake. 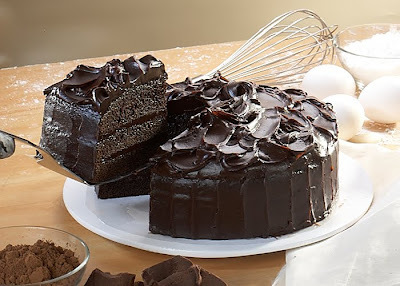 This sure comfort food list-topper is made with its moist chocolate pound cake layered with luscious chocolate fudge filling and then smothered with velvety chocolate icing. It’s the kind that will make you savor every bite, scrape off the last bit of crumb and icing on the plate, and then lick the fork clean. Every time you need a slice of warm embrace, a back rub, or a reassuring word, you know you can easily get a Chocolate Fudge Cake in all Red Ribbon Stores nationwide – now that’s a tremendous comfort in itself. Chocolate Fudge Cake is available in regular size for P495.00 and junior size for only P295.00. This is one invitation I won't allow myself not to bring my husband John and the 3 rug rats, Julia, Rafael & Juan. In my family, I'm the sweetest (ehem, ehem!!) but the 4 of them are the ones with sweet tooth. So off we went at Red Ribbon Bakeshop - Rizal Drive, Fort Bonifacio. 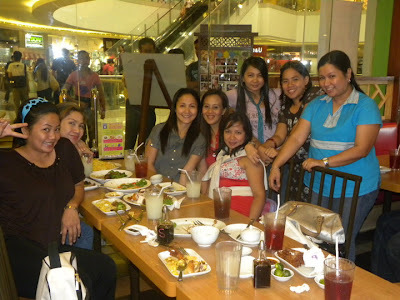 What made this invite super special is seeing my Super Mom Blogger Friend, PEHPOT. International Sous Chef, Sherrie Tan graced the event. She shared a bit of her experiences as chef and gamely answered all the Bloggers questions. Each Blogger went home with this: Red Ribbon's The Best Chocolate Fudge Cake, umm what a sweet treat! Congratulations to Star Ojaliza and C.C.M Arcanghel for winning Ainon Baby Items Promo. Please wait for my email as to how you can claim your prize. 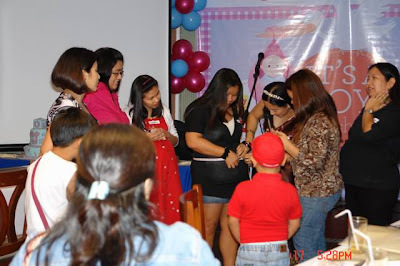 As a pioneer member of Parentin.tv, I was invited to attend Tin Tin Bersola-Babao's Baby Shower last January 2010 provided I bring a preggy friend. She, on the other hand learned of Tin Tin's Baby Shower while shopping at Mothercare. After CCA, she added me up on FB. Told me we have a common friend on FB by the name of Edwin Francia (who was my long time friend from Bayantel), turned out they are cousins. I got a chance to talk with her during Parentin.TV's First Year Anniversary. I then invited her to join me on Mommy Academy come July 10, 2010. . She is busy, I am busy so we didn't have the time to chat even online. 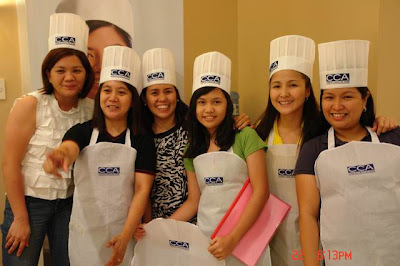 After Mommy Academy event, Electrolux (in cooperation with Mommy Academy) were looking for moms who'd like to join their Wok-a-holics Cook off Challenge. My teammate was supposed to be my husband, due to unforeseen events, my husband wasn't able to join me. Meanwhile, Jenny Roxas told her we're joining a cooking challenge, ask her if she wants to join too. I told Jenny to tell her to call me. When she called and asked me if she can join the cooking challenge I said yes. I didn't know then she's good at cooking. I just told her we'll be teammates since my husband backed-out. Long story short...we won 1st Place at the Wok-a-holics Cook off Challenge. I am no good in cooking, as I've said in my previous blog, I can only cook beef steak, chicken curry and afritada...but because of her, I won the following: microwave oven, table top electric griller, blender, and a 4 burner gas range all from Electrolux. (Naiinggit ako kay Enzo, so I slept...while she prepares everything) I believe that any person who comes along has something to give or share to enrich our lives. I am not pertaining to the material things mentioned above (but those are a BIG PLUS!). What I truly appreciate from meeting her is her ability to tell me straight the traits I should mellow on. Not very many people are frank enough to voice out their opinion or view on somebody. I am thankful to her. She has shown me that honesty will forever be a good policy. 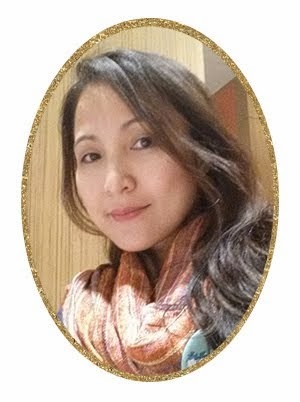 The person I am thankful for: LOURDES VINDOLLO-LABII, loyal, faithful and supportive wife to Jerry, loving and caring mom to Luis and Enzo, kind daughter to her parents, understanding eldest sister to her siblings, a dependable friend to many...a very good cook, my Electrolux Wok-a-holics partner.